The Book Chook: Let's Celebrate Random Acts of Kindness Day! 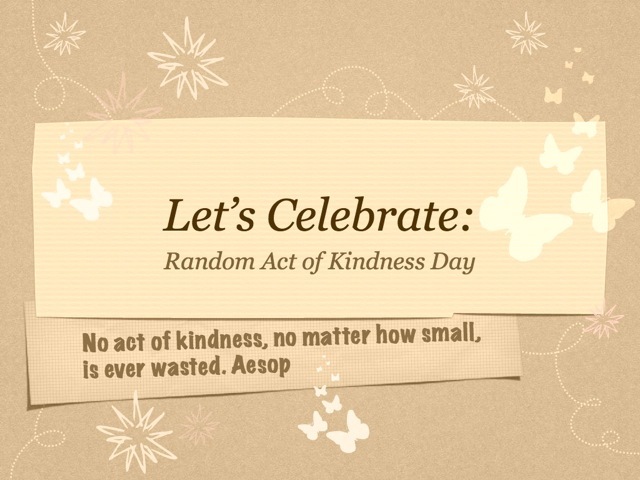 Let's Celebrate Random Acts of Kindness Day! Being kind is perhaps something we take for granted. I quite like the idea of a special day like Random Acts of Kindness Day, because it reminds me to take time out and think about being kind. There are so many things to ponder on such a day. Maybe we find it easier to be kind to a stranger than to someone in our family - what can we do about that? What acts of kindness can we perform for friends, family, co-workers, neighbours, acquaintances and strangers? What IS kindness anyway? How does another's kindness make us feel? Can something as simple as a hug, a smile, or a note of thanks be an act of kindness? Random Acts of Kindness Day takes place in the USA on February 17. In New Zealand, it's September 1. It probably doesn't matter when we celebrate it, so long as we DO! Being kind to a friend or stranger, for no reason at all, seems to me a way to give society a little nudge in the right direction. If you and your child are looking for just the right act of kindness to practise, browse through the list at the website. Teachers will love the graded lists of lesson suggestions too eg this one for preschool. Here's a video (Thanks@larryferlazzo!) that might give you some inspiration - "Watch as the camera tracks an act of kindness as it's passed from one individual to the next and manages to boomerang back to the person who set it into motion." Sadly, I think we also need to discuss safety concerns with our kids when we talk about being kind. I wish we lived in a world where we could always be spontaneously helpful and kind. But we don't. You might decide to be kind to others as a family, or discuss times where you know your child will be safe and able to reach out to others. The important thing I believe, is to concentrate on being kind where we can. Oh! This is right up my alley! Thank you so much for sharing. I have just had a children's book published which is all about random acts of kindness. Especially written for kids! I would love to share it with you. It's called My Happy Gift. You can go to www.LeanneSheaLangdown.com to find out more. 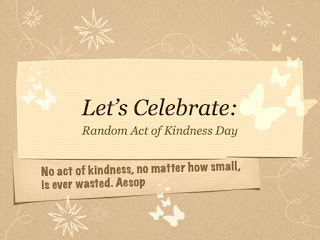 Happy Random Acts of Kindness Day!! Thanks for letting us know about this, Susan! I live in the US and didn't know. I feel inspired already. Wouldn't it be nice if people passed along kindness every day? Even a smile or a simple thank you can make such a difference. I really appreciate the reminder. @LeanneFits in perfectly to this special day, Leanne! @Dawn Morris I agree, Dawn - no effort to smile or say thanks, but some people seem to want to horde theirs! I just watched this video with my kids and told them about Random Acts of Kindness. We all enjoyed the video. Thanks for sharing this today. @MichelleGreat to know you and the kids benefited from this special day, Michelle!